Pulling the trigger for the start of irrigation in the spring: Too much too soon for walnuts? 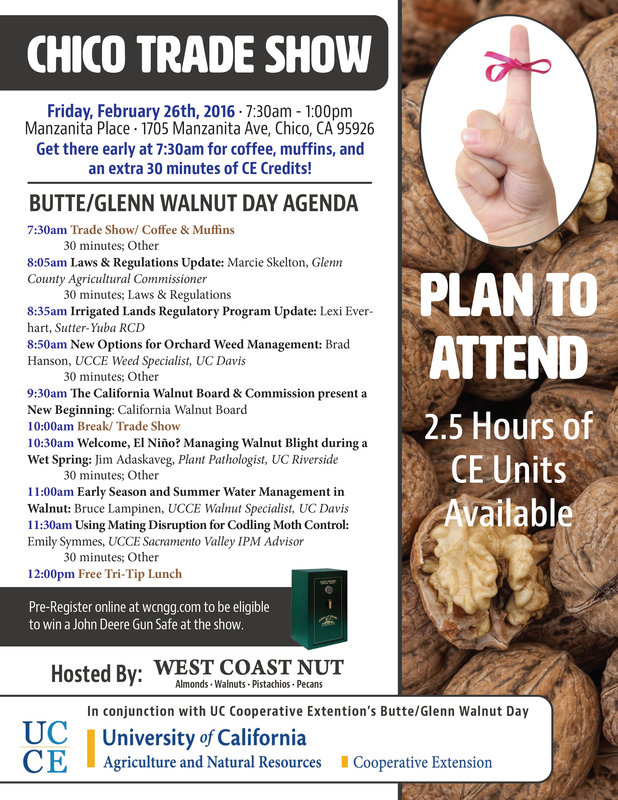 Please check out the attached flyer for the 2019 Chico Almond Nutrient and Water Field Day. Is this a Year to Skip Thinning? Friday, October 19th, 2018 at 7:30 a.m. - 9:00 a.m.
Join University of California Cooperative Extension (UCCE) Area IPM and Farm Advisors to discuss current pest management and production issues. We will largely focus on orchards crops (but everything is on the table for discussion!). These meetings are open to all interested growers, consultants, PCAs/CCAs, and related industry. Planned topics for this meeting include (but not limited to!) updates on insect and disease activity and in-season management considerations. Please contact Emily Symmes to request additional topics or bring your questions to the meeting! or ejsymmes@ucanr.edu by June 13th to let us know you plan to attend. What are we learning from orchard biomass (chip and mix) studies? Click link inside for agenda, map, and lunch reservation form. Evaluating New Rootstocks: What’s the Latest? Here is a quick announcement for you! Here is an updated version of the September Walnut Newsletter. Here is the Pdf version of the Orchard Facts- Almond Newsletter for October 2016. My apologies for the first issue. It was not in Pdf format. Why are Some Trees Yellow and not Growing? Warm postbloom weather = early harvest? How hot was it at bloom, 2015? Walnut Orchards Planted in 2014 - What to do now? Orchard Spraying Field Meetings coming up! How Hot was it at Bloom, 2014? How Hot Was it at Bloom? Why are Some Individuals Trees Turning Yellow, are Weak, or Not Growing? Prune Orchard Fertility Review: Focus on the "Key 3"
When Will Harvest Start in 2011? A New Season - When to Begin Irrigation and How Much Water to Apply? Why Are Some Individual Young Walnut Trees Turning Yellow and Not Growing?